How About Leaving the People Alone? There is a reason why the tradition of keeping your vote secret is often respected. Even if not so much anymore. Nothing like this election year has brought up how political polarization divides people. Even in some cases end friendships and tear up families. Because people cannot help but taking politics personally. Perhaps the rise of social media has something to do with the increased political polarization as people get more easily exposed to more extreme political views than those appearing on mainstream media. But probably the most interesting part is when political commentators like Glenn Beck and Stephen Colbert, who have been blowing into this fire for years, coming on TV and wondering how we got here. Bill Maher just confessed that they should not have been so hard on Romney and McCain because their warnings are falling on deaf ears about Trump. But it is not just the common people, comedians or fringe commentators who have been polarized so venomously. All the judgments of the pundits and gurus on TV on why Hillary Clinton lost and why the hell America did it have been amusing, to say the least. It has been a whitelash, according to Van Jones. It is because the racist white America has reacted against the Obama Presidency because he is black. Because apparently, they were on a break during the Obama years. I thought only people like Sean Hannity and Rush Limbaugh came up with such ideas. Trump’s rise has clearly emboldened the Alt-Right, the white supremacists, and the neo-Nazis. Just like the victories of Narendra Modi and Benjamin Netanyahu have allowed the respective right wings to become more vocal and active. But is it fair to paint all of their voters with the same brushstroke? But it is a great mystery indeed why so many voters opted for such an unconventional candidate, who has displayed such inappropriate and unacceptable behavior. And to some, even made a mockery of the democratic system in the United States and could continue to do so. Is Donald Trump scary? Yes, I agree. But I am also not surprised that he is backtracking on more of his extreme positions. We don’t even know if he really has any political ideology, to begin with, other than his love for self, money, and power. There are, of course, sane liberal commentators out there who are trying to seriously figure out the causes of the Democratic loss. But even most of them have a blind spot for the smugness and overconfidence in the Democratic camp. If someone voted for Trump, it does not automatically make them racist. Because apparently a lot of them voted for Obama for two straight terms in Florida, Wisconsin, Michigan, Ohio, and Pennsylvania? Obviously, they made a right choice back then. Similarly, if someone voted for Hillary Clinton, it does not make them for corporate greed, elitism or corruption. Alright, but either way, it sure makes them sexist. Because that beats racist every time. Figured if something else went wrong? 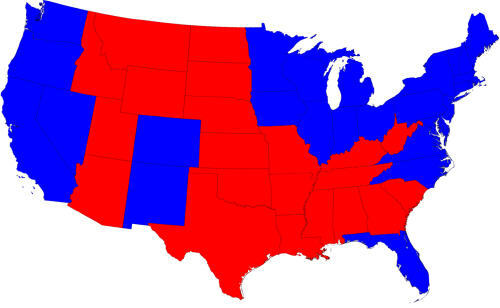 Why did Hillary Clinton fail to win so many counties that Obama won, who was clearly more radical of the two in 2008? Why did she lose the working class men? Why did she lose the independents so clearly? Why did she lose Susan Sarandon? Even if she won the popular vote. Why more Democrats voted for Trump in those swing states than the Republicans voting for her? Few people see it this way, but perhaps the election of Donald Trump is the part of the same madness of hope and change that got Obama elected. And the rest of the protest vote going to Sanders, Johnson and Jill Stein. But is that all? What if the campaign the Democrats ran was absolutely lame, negative, and broken? And probably was so terrible that you could not beat Trump with all the disasters during his campaign. No more Daisy ads working anymore. But guess what? Trump emerged the victor out of all that mess. Then, of course, it is always the fault of the poor third party voters who are trying to fight the two party system so many people are critical of. The Gary Johnson protesters and the Jill Stein protesters. As if they are not allowed to have their own crazy, kooky political views. While I believe that these two tickets would have been an even bigger disaster than Trump in 2016, they offer a plenty of interesting ideas. Gary Johnson got more than 4 million votes. I can hardly think of another Libertarian candidate ever doing a better job in the national polls. It’s not a spoiler. People are making a statement. Finally, it is always the fault of the people who have not voted. The most irresponsible of all citizens. Oh, and guess what, Colin Kaepernick has no right to make a political statement by kneeling down during the national anthem before his NFL games. So how about forcing these 45 million people to vote and to get them to attend a polling station or send in a ballot? I say they have a right to not vote. Isn’t that a vote in itself? Yes, each and every one of them has a right to make a political statement, no matter what, as long as they are doing so in a non-violent manner. Even by not voting. Criticize them all you will, but never think about forcing a political statement down their throats. Our complaints about democracy would make sense when we give people the freedom who to vote for without bullying and pressuring them. Without turning them into social pariahs. Because in this case, it is very easy to become who you criticize. So how about leaving people alone for a change? They just might listen to your crap then.